New Orleans Style By Bill Russell. Compiled And Edited By Mike Hazeldine And Barry Martyn. New Orleans: Jazzology Press 1994. Soft Covers 224 Pages. 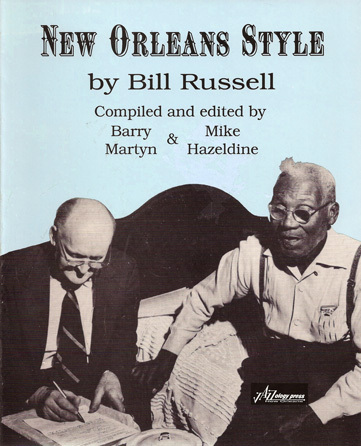 Jazzology Press Formed In 1993 As The Ghb Jazz Foundation's Publishing Division Is Pleased To Announce The Publication Of Its Second Offering: New Orleans Style By Bill Russell Compiled And Edited By Barry Martyn And Mike Hazeldine. "at The Dawn Of This Century A New Music Was Born In New Orleans." So Begins Bill Russell's Essay That Opens The Book. The Following Pages A Series Of Interviews With 24 Legendary Musicians, Attempt To Shed Light On The Beginnings And Growth Of That New Music And The Meaning And Nature Of The "new Orlenas Style."